Karesh Glass, LLC. 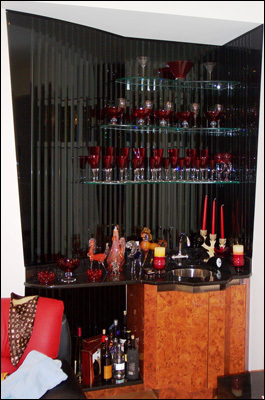 is a premier provider of custom interior mirror & glass solutions. Jorge Diaz, the owner, a young entrepreneur has been in the glass business for 12 years. His vision as an apprentice in the glass business, many years ago, was to own a business that would allow his creativity and the vision of his customers to become one beautiful masterpiece. With his background in construction and years of experience in the glass industry, Jorge offers a unique & multifaceted approach to Karesh customers. Jorge & his team take pride in providing customers top quality mirrors & glass with optimal attention to detail and unsurpassed customer service. Mike Karesh, consultant, has been in the glass industry for over thirty years delighting customers with extraordinary service, unsurpassed craftsmanship, creativity and affordability. Mike understands that the products he designs for you became a permanent part of your home, and the quality has a direct impact on the look of a room as well as the functionality of your bath or shower. There has not been a shower enclosure that has stumped Mike yet! Karesh Glass, LLC. is the only company in the mid-west that consistently designs shower enclosures to be totally frameless — no metal header frame across the top and no framing channel on the walls or base. We encourage you too look through our website for cleanest look possible.